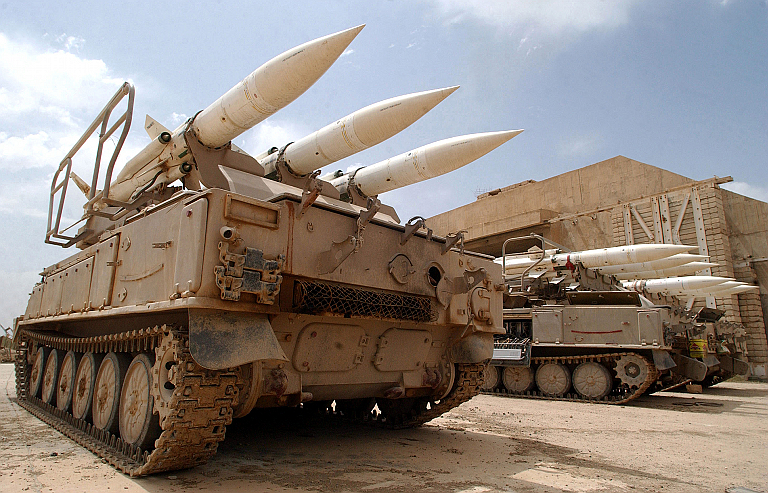 The 2K12/3M9 Kvadrat / SA-6 Gainful remains widely used by Syria (US DoD). Of all the Middle Eastern nations, Syria has one of the most robust SAM networks. Multiple SAM sites provide redundancy, allowing for overlapping coverage in many critical areas. It should come as no suprise that evidence of an illegal incursion into Syrian airspace by Israel was found in an area largely undefended by SAM systems. 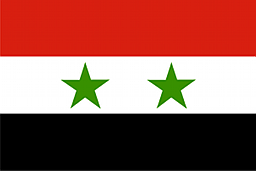 The Syrian strategic SAM network relies primarily on Soviet-era systems. The following strategic SAM systems are currently in service as part of the fixed air defense network: S-75 (SA-2 GUIDELINE), S-125 (SA-3 GOA), and S-200 (SA-5 GAMMON). The 2K12 (SA-6 GAINFUL) tactical SAM systems is also employed at a number of fixed sites to provide additional support to the purpose-built strategic systems. Currently, there are 131 active SAM sites inside of Syria. The following image depicts the locations of these sites. S-75 sites are red, S-125 sites are blue, S-200 sites are purple, and 2K12 sites are green. 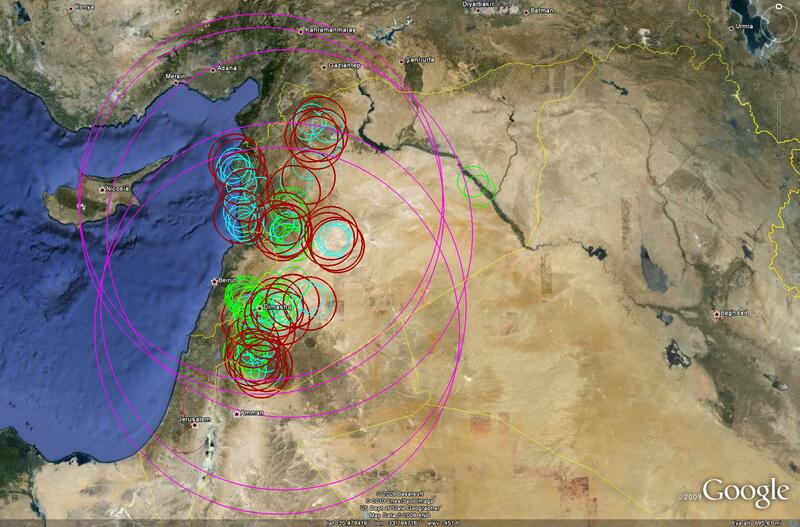 The following image depicts the overall SAM coverage provided by Syrian air defense sites. Using the same color scheme applied in the previous image, S-75 range rings are red, S-125 rings are blue, S-200 rings are purple, and 2K12 rings are green. 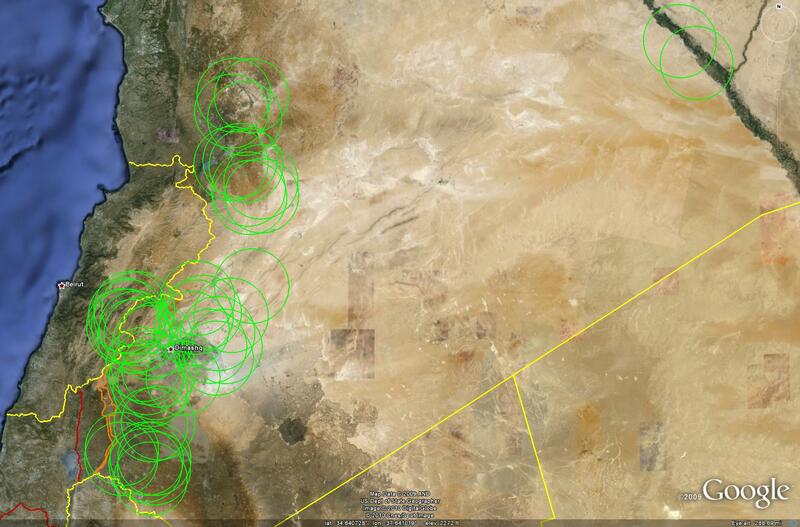 Early warning for the Syrian air defense network is handled by 22 Early Warning radar sites. One of these sites possesses a 36D6 TIN SHIELD EW radar system. The majority of the remaining Early Warning sites employ standard FSU Early Warning systems, including the P-35/37 BAR LOCK, P-12/18 SPOON REST, PRV-16 THIN SKIN heightfinder, 5N87/P-80 BACK NET, and 5N84/P-14 TALL KING. 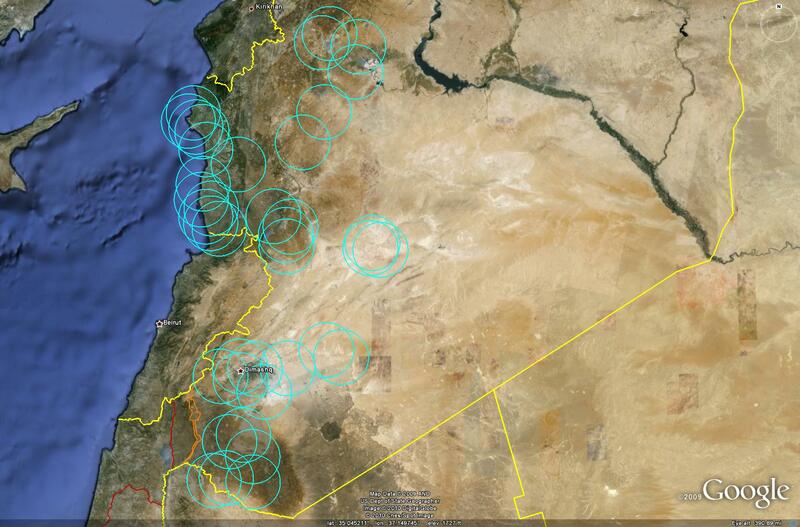 There are currently 37 active S-75 sites within Syria. With one third of Syria's S-75 sites being operational, it would be simple to conclude that the S-75 is no longer heavily relied upon. However, given that the S-75 is still deployed in various key areas, this would seem to be an illogical conclusion. The more likely scenario is that early systems have exceeded their service lives and been withdrawn, and other systems have perhaps been stored for future use or simply withdrawn to downsize the network into a more financially manageable operation. There are currently 39 active S-125 sites within Syria. The S-125 appears to be an extremely active system. Sixteen prepared S-75 and S-125 sites have seen S-125 batteries come and go since 2001, demonstrating Syria's ability to periodically adjust its SAM deployments. Approximately half of Syria's S-125 batteries are currently sited on prepared S-75 locations, a fact which demonstrates the importance of not only identifying site layouts but the systems occupying said locations. 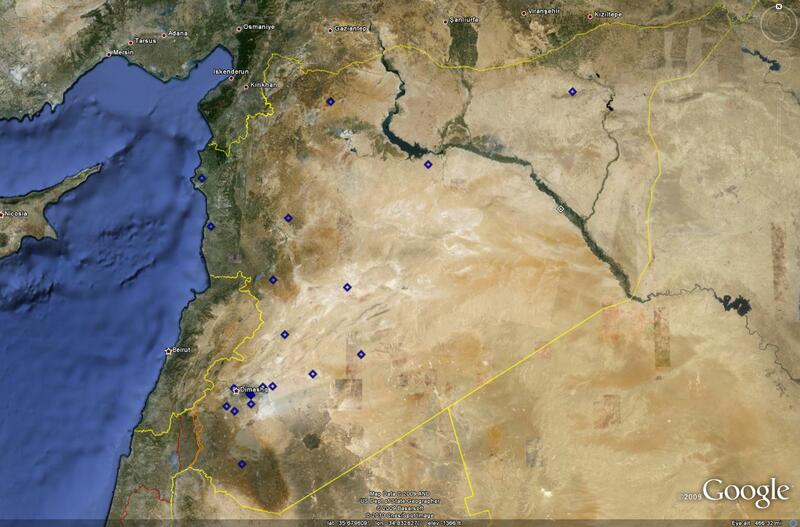 There are currently 5 active S-200 sites within Syria. The S-200 provides long-range barrier air defense along the western border and into the Mediterranean. There are currently 50 active 2K12 sites within Syria. Despite being a tactical SAM system, emplacing 2K12 batteries at prepared sites allows them to function as part of the overall strategic SAM network. Due to their inherent mobility, these systems could be rapidly relocated should the need arise. 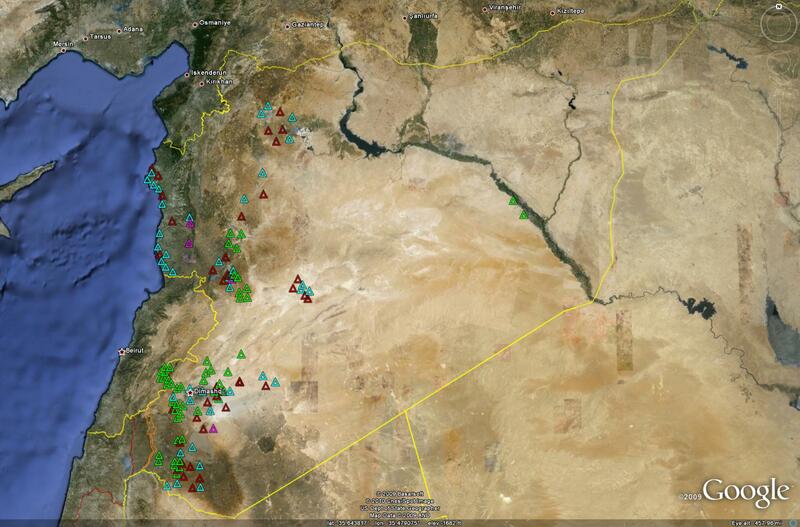 There are currently 120 unoccupied, prepared SAM sites inside Syria. These sites have been identified as either S-75, S-125, S-200, or 2K12 sites, based on their configurations, and can be broken down as follows: 80 S-75 sites, 16 S-125 sites, 2 S-200 sites, and 22 2K12 sites. These empty SAM sites can perform multiple tasks within the overall air defense network. They can be employed as dispersal sites for existing air defense assets, complicating enemy targeting. They can also be used to deploy additional SAM systems currently held in storage if more air defense assets are deemed necessary in a given sector. Syrian strategic SAM deployment is concentrated in six areas. These areas are around the cities of Hims, Halab, and Damascus, Tiyas air base, the Mediterranean coastal area, and the area adjacent to the Golan Heights. These SAM concentrations are emplaced to defend against obvious potential threat ingress routes. The largest perceived threat to Syrian sovereign airspace is Israeli Air Force activity. Syria enjoyed a relatively equitable relationship with Iraq, and as such likely did not see a need to deploy air defense assets in the eastern part of the nation. 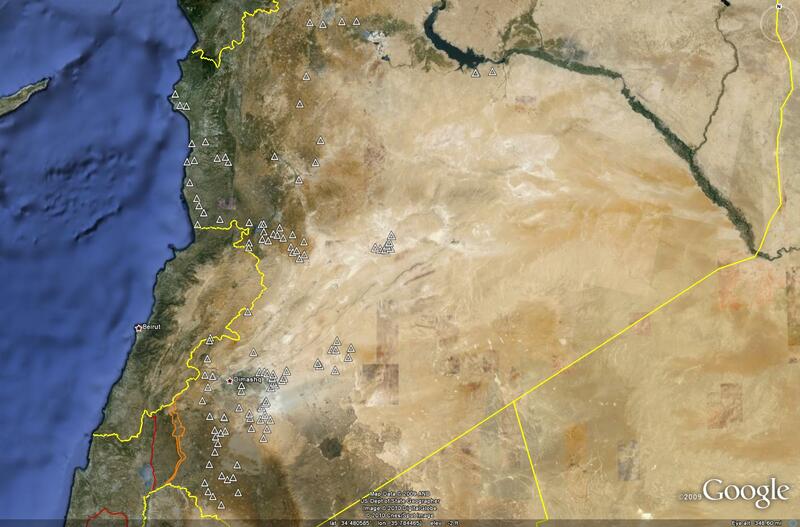 This "empty" airspace could easily be patrolled by MiG-23, MiG-25, or MiG-29 interceptors if the need arose. There are important issues with the Syrian SAM network that need to be addressed. The main issue is the nature of the SAM systems themselves. 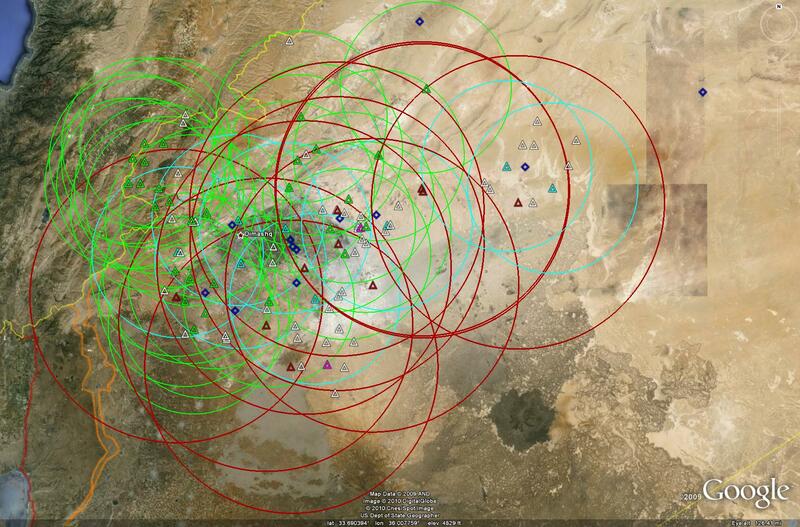 All of the SAM systems in the Syrian inventory have a single-target engagement capability. Some of the S-200 sites have been noted with multiple 5N62 SQUARE PAIR engagement radars, allowing those sites to engage multiple targets (one per engagement radar), but the S-75, S-125, and 2K12 sites can only engage one target per site. 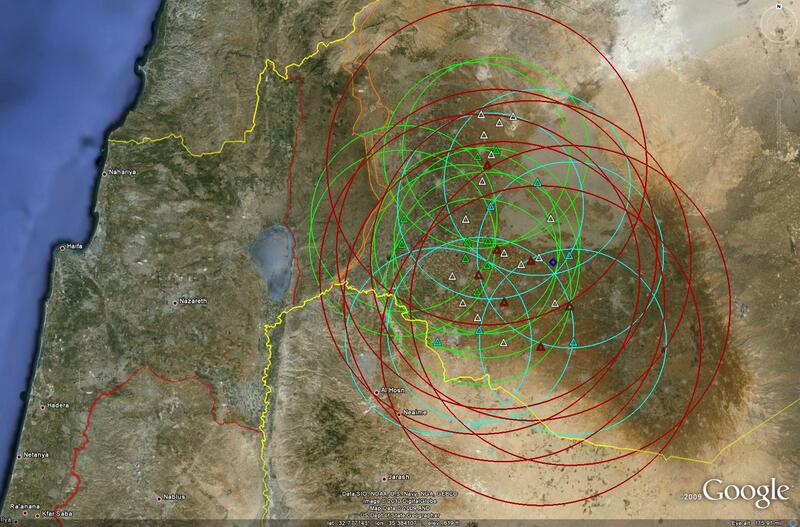 This leaves the Syrian air defense network susceptible to saturation. Another issue is the employment of the 2K12 in a strategic role, tied to fixed sites to provide close-in defense. The 2K12 has been captured and exploited thoroughly by both the American and Israeli militaries and as such cannot be counted on to reliably defend against an airborne threat. The same could be said of the S-75 and S-125 SAM systems as well, of course, but the 2K12 suffers from the additional drawback of being constrained to a fixed location. The 2K12 is most effective on the move, whereby it can catch opposing aircraft off-guard by appearing in new locations that were previously undocumented. This may be a part of the Syrian strategy, but for now, the 2K12 remains a stationary target insofar as how it is currently deployed. Syrian reliance on aging and well-known Soviet-era SAM systems is a serious defensive liability. This is certainly part of the impetus behind Syria's current drive to purchase more advanced SAM systems from Russia. Another important issue to address is the fact that there are two noticeable gaps in Syrian SAM coverage. 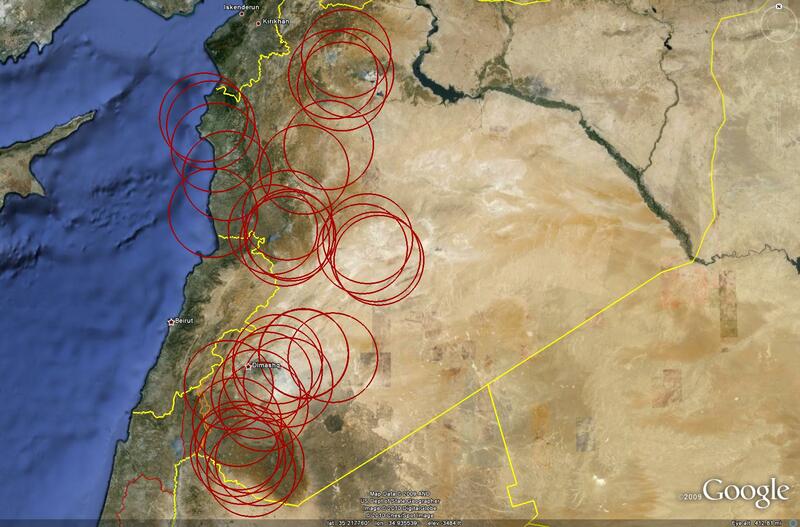 While these areas are in fact covered by S-200 sites, they lack any sort of low-altitude coverage or close-in defense. Approximately midway between Damascus and Hims, and midway between Al Lathqiyah and Halab, are large gaps in the SAM coverage, areas where there are not even identified empty sites where fixed systems such as the S-75 or S-125 could be emplaced if need be. These gaps are not necessarily an invitation to invasion, however, as key targets such as the capital are still heavily defended. The first area to be examined is the area surrounding the capital of Damascus. 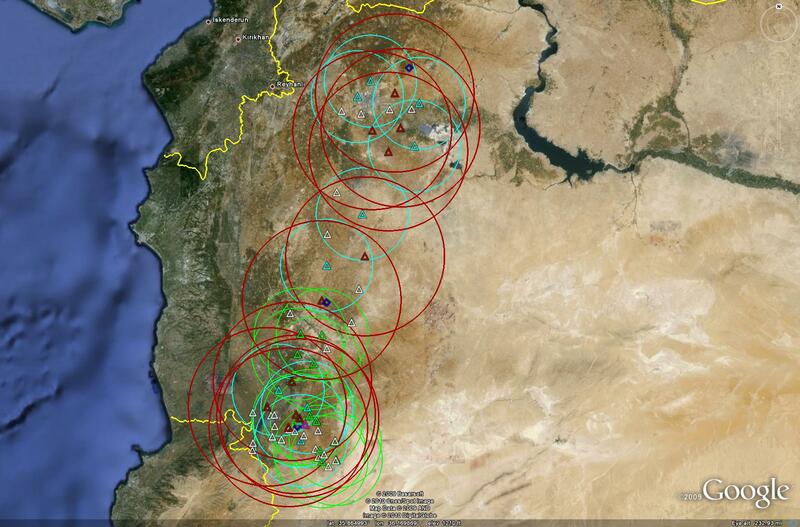 Damascus is defended by ten S-75 sites, eight S-125 sites, and twenty-eight 2K12 sites. Two of Syria's five active S-200 sites are also located in close vicinity to the capital, as well as twelve early warning radar sites, including the 36D6 site. Forty-eight empty dispersal sites are also in the area, providing for an increase in defensive capabilities should the need arise. SAM coverage of the capital is relatively robust even without the addition of further SAM sites, and careful placement of S-125 and 2K12 batteries provides overlapping close-in defense in conjunction with the longer-range S-75 sites. Apart from the capital, the most important piece of real estate in Syria may be that in the southwest, adjacent to the Golan Heights. This area is defended by seven S-75 sites, six S-125 sites, and nine 2K12 sites, and supported by one identified early warning site. 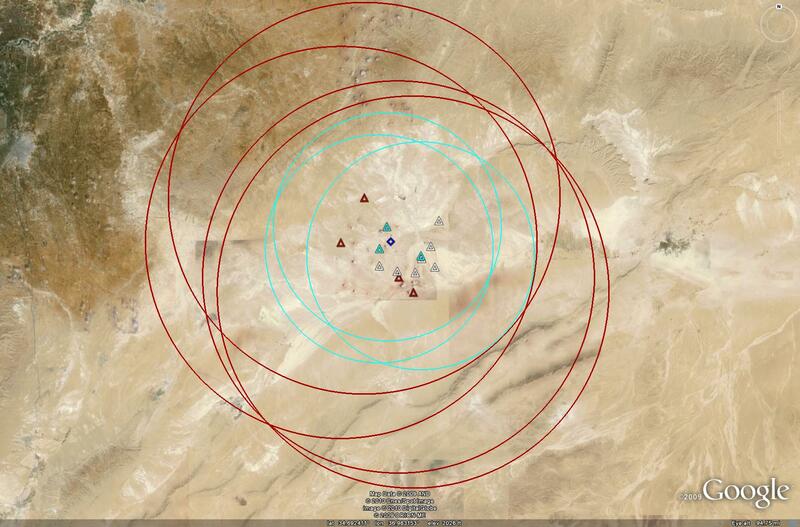 One of the S-200 sites located south of Damascus also can provide coverage of this area. 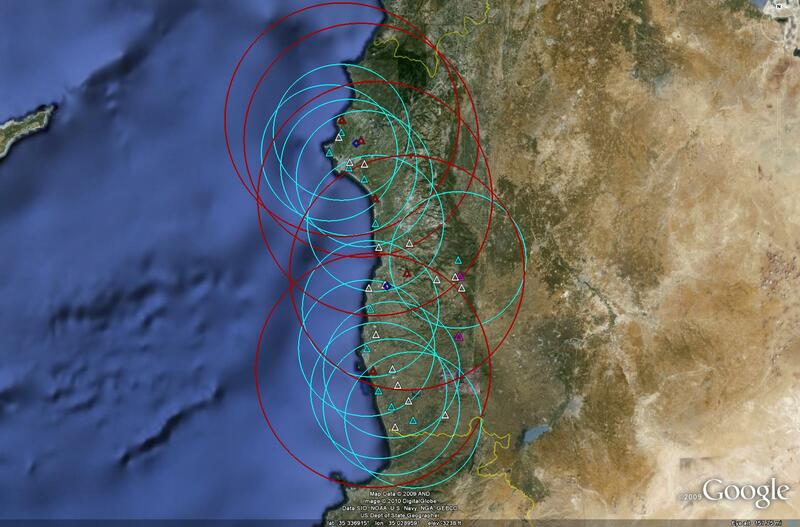 There are sixteen identified dispersal sites in the area, but the large concentration of SAM systems provides a very well put together air defense network over southwestern Syria without any further increases. The large number of 2K12 sites is clearly meant to counter the threat posed by Israeli Air Force fighter aircraft, the 2K12 being more maneuverable and better suited to engaging fast jets than the more strategically-oriented S-75 and S-125 systems. The Golan-area SAM network is clearly oriented to provide barrier air defense against airborne threats ingressing from the west. 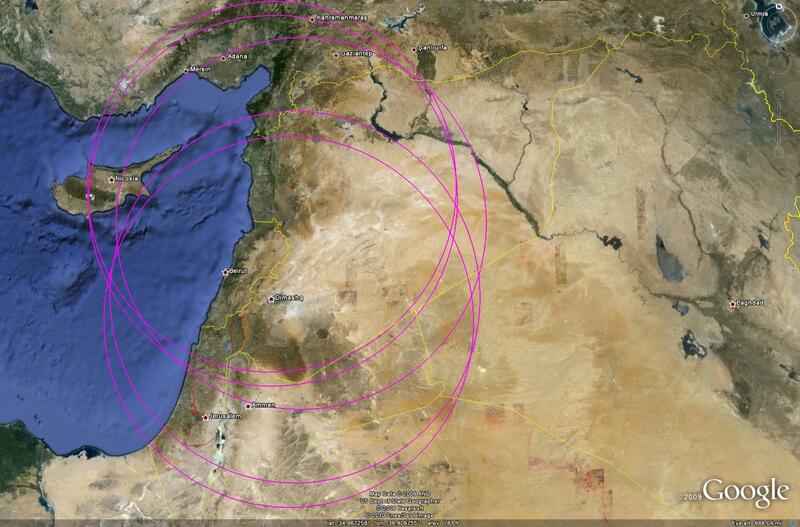 The same sort of barrier air defense network can be found along Syria's Mediterranean coastline to the north. Extending from Al Lathqiyah to Tartus, five S-75 and twelve S-125 sites provide air defense along Syria's northwestern border with the sea, supported by two early warning sites. There are also two S-200 sites in the area to provide long-range air defense over open water. Sixteen dispersal sites in the area are situated to provide an increase in defensive capability. There is a second SAM barrier behind the coastal defenses, protecting the area from Hims in the south to Halab in the north. The barrier consists of eleven S-75 sites, ten S-125 sites, and eleven 2K12 sites, supported by three early warning sites. An S-200 battery is positioned southeast of Hims, and there are thirty dispersal sites along the line, mostly concentrated in the south around Hims. Tiyas AB is defended by four S-75 and three S-125 sites, supported by an early warning site, and surrounded by seven dispersal sites available if necessary. Air defenses surrounding Tiyas are not particularly robust when compared to the rest of the network, but they do provide a heightened degree of security and are overlapping and redundant to a limited degree. Syria's SAM network is very robust on paper, and would appear to offer a significant degree of protection at first glance, but this is not necessarily the case. Against a limited incursion, the Syrian air defense network remains capable, despite the reliance on aging Soviet-era systems. This is one likely factor which drove the Israeli Air Force to circumvent SAM-defended areas when striking the Dayr az Zawr suspect nuclear facility in 2007. Said reliance on Soviet-era legacy SAM systems will provide a serious handicap when facing a major air incursion by a modern opponent. It is time for Syria to modernize its strategic SAM defenses if it desires to retain the ability to defend its airspace in the 21st Century. The aforementioned data is based on analysis of the available open-source satellite imagery of Syria and may not represent the entire air defense network.